Install Sitecore 7 initial release. 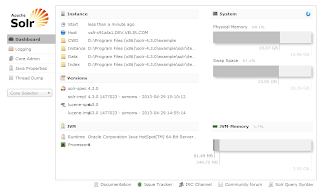 Download the Solr support package from SDN.and the Solr Support Package from the SDN Sitecore 7 download page. 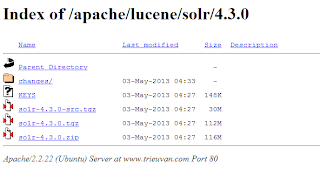 Download SOLR 4.x from http://lucene.apache.org/solr/ I did this walkthrough with SOLR 4.2.0, but at the time of this writing the current version is 4.3.0. The download link will take to a list of mirror sites, where you will be given the option of downloading SOLR in ZIP format. Extract to a location of your choice (I used "Program Files (x86)"). UPDATE (June 11, 2014): This walk through does not work with SOLR 4.8.*+. Sitecore's Schema generator, used in step 8 below, has assumptions about the structure of the Solr Schema file which are no longer true after Solr 4.8.*. This issue was found by Sen Gupta and has been reported to Sitecore. I recommend using Solr 4.7 until this issue is corrected. 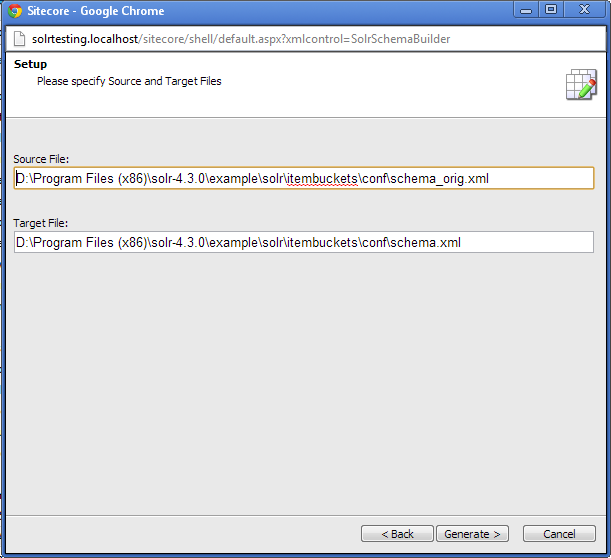 Alternatively, you can update the schema.xml file as described in step 8 below. Now let's see if we can fire this up! 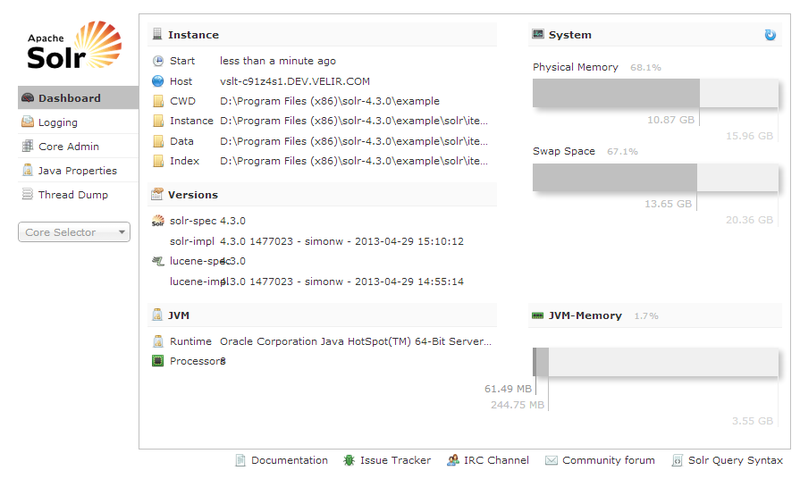 Open a command prompt, go to the SOLR-4.3.0\example directory, and type "java -jar start.jar". A bunch of text should fly by, ending with: "Started SocketConnector@0.0.0.0:8983. Now that we have Solr running, let's wire it up to Sitecore. Update for Solr 4.8 and later: You will need to update the schema.xml file manually as described here before using the "Generate the Solr Schema.xml" option. This is a temporary workaround, as the Sitecore control panel tool does not take into account schema changes that occurred with Solr 4.8. Thanks to Stephen Pope for providing this information. 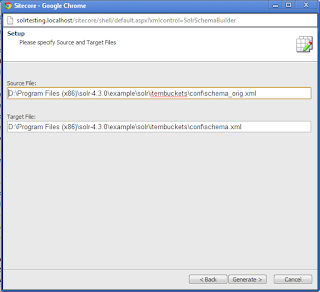 Go to the Sitecore desktop control panel, select "Indexing", then "Generate the Solr Schema.xml file"
Under source, put the path the full path to "schema_orig.xml". 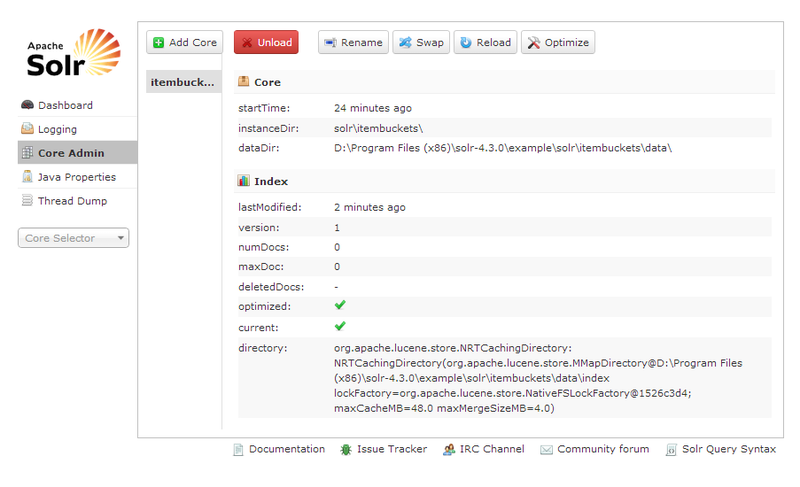 Now go to the SOLR console, select "Core Admin" on the left, then "Reload" on the top, to load the new schema. Now it's time to change Sitecore's configuration to use the new index. First, let's add the new Sitecore.ContentSearch.Solr.Indexes.config file from the Solr Support Package to the App_Config/Include directory. Rename the extension of all seven files with "Lucene" in the name (e.g. to .example), since we don't want Sitecore using these. It is also necessary to add Castle.Core and Castle.Windsor. I used version 3.1.0 for each. Getting these is tricky. You can create a solution and use NuGet, or you can pull them directly from the Nuget site, using https://www.nuget.org/api/v2/package/castle.windsor/3.1.0 and https://www.nuget.org/api/v2/package/castle.core/3.1.0 Hitting these URLs on Chrome automatically downloads a .nupkg object, which you can rename to a zip archive. Both archives contain a "lib\net40-client" path. Copy Castle.Windsor.dll and Castle.Core.dll from lib\net40-client of each package to the website bin directory. Go to the Sitecore desktop. Try a bucket-style search (using the magnifying glass icon) on the Sitecore root node. It should return no results. Go to Control Panel\Indexing\Indexing Manager, and rebuild the Core, Master, and Web databases. Retry the search. It should work now! Please let me know on Twitter (@DanSolovay) or the comments if this walkthrough works for you, or if you run into any issues. Because Sitecore talks to Solr via a URL, SOLR can be moved to a separate server, or the cloud, with only a one-line configuration change in Sitecore. 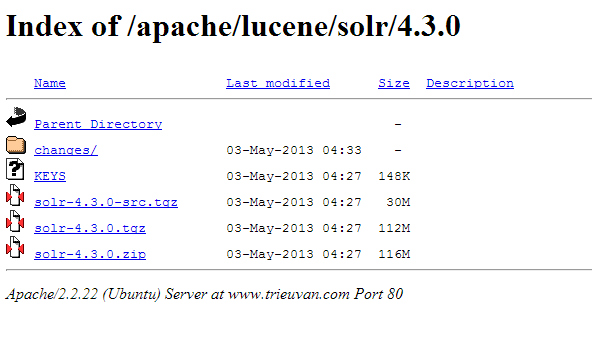 The SOLR console provides a lot of the functionality that would require Luke with Lucene. These directions worked great for me. This is a fantastic guide to integrating Solr with Sitecore 7. Worked great for me and now I'm writing up a quick guide for my coworkers, highlighting the issues and speedbumps I encountered along the way. Thanks! I've updated the post. Thanks for raising this. Schema Looks Different with Sitecore 4.8? So here is what is causing issue! SOLR schema has changed in the versions higher than 4.6.1. I tried to look into the fields configurations into the SOLR schema generated using Sitecore 7.2 SOLR schema Wizard and found out that it is not generating the schema as expected. Apparently, Sitecore used the tag to inject Sitecore fields into the newly generated schema and fails here! Solutions: Stick to SOLR 4.6.1 as this version has the schema Sitecore Schema Builder Wizard expects or hand copy the fields in SOLR schema files if you need a feature of SOLR 4.8? While Solr is up and running and I can navigate to http://localhost:8983/solr and use Solr UI ! Please check wheather you are initilizing unity in global.asax? 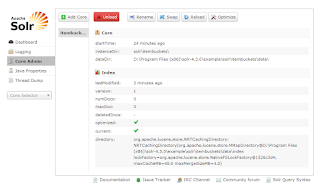 I'm doing a Solr setup with Sitecore 7.2 and Solr 4.9.1. There's another change needed in the schema.xml. The "pint" field type needs to be enabled, it is commented out in the example schema. This field type will be deprecated in Solr 5, but it is still available in 4.9+. So I got this all working fine and I have Solr working with Sitecore 7. Now (for other reasons in my app) I need to be able to add custom code for the Application_BeginRequest event in my Global.ASAX. However my Global.ASAX now inherits from Sitecore.ContentSearch.SolrProvider.CastleWindsorIntegration.WindsorApplication. So how can I add custom code to my Application_BeginRequest event? Do you know if this configuration works with sitecore 8 and Solr 4.2.0? http://sitecore-community.github.io/docs/search/solr/Configuring-Solr-for-use-with-Sitecore-8/. While rebuilding sitecore_master_index from control panel's index manager, I am getting system.reflection.targetinvocation exception. Please find attachment of error screen shot for error details. Could any one please suggest the resolution for this error. While rebuilding master (or) web (or) core index, I am getting below exception. Below error is for core index. Could any one help please. field name="_displayname" type="text_general" indexed="true" stored="true"
dynamicField name="*_t_da" type="text_da" indexed="true" stored="true"
dynamicField name="*_t_da" type="text_general" indexed="true" stored="true"